Central to many Pagan traditions is the "Wheel of the Year", the eight sabbats of festive days that celebrate the seasons. In "Dancing the Sacred Wheel", the author examines the seasonal Wheel and associated folklore while following its journey from her home in the Southern Hemisphere. 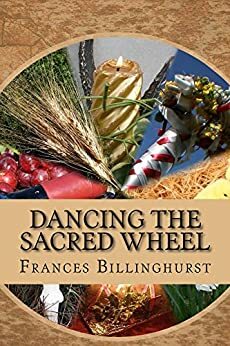 By combining traditional myth and meaning of each sabbat with her own personal experience, the author captures the essence of each festival while celebrating them in accordance with the energies “down under”. By doing this, she encourages the reader to look deeper at their own observances in order to gain a more in-depth level of knowledge and understanding of the Wheel of the Year – even amongst changing weather conditions. By providing snippets from rituals performed by her own coven as well as activities and recipes that honour each sabbat, this book is to inspire both ritual for solitary and group workings alike. A great book for all in the southern hemisphere. France's is a very talented writer with an obvious working knowledge of her craft-would certainly recommend. I bought the Kindle version of this book and I'm finding it very interesting. I'm from the west coast of New Zealand so don't face the same weather conditions the author speaks of but nationally these conditions do appear at times. My biggest complaint is that the book did not transpose to Kindle format with ease. There appear to have been a number of tables in the book that have been turned in to lists that make no sense. Another is that the references appear in red in the main text (not necessarily a negative but distracting). I tried changing the font but this didn't fix anything. According to the author blurb on Amazon, this author is prolific in writing various articles. In places this book reads like a mix of an article and a Masters paper. On the plus side, it is jam-packed full of relevant information for the Southern Pagan. More for the Australian with its references to Aboriginal beliefs but it gives an idea on how to look at other native belief systems. Questions are raised on how to use the northern mix of sun and agricultural based sabbats in the southern hemisphere when the seasons don't always allow the same progression of agricultural flow. Examples are given to illustrate the problem. If you are only interested in a good read then the Kindle is the way to go. However, if you want to use this system in your own practice then it would pay to get the book so that the material is in the proper format. I intend to get the book. This book was written by one who really knows the craft. It also acts as a marvellous and exciting teaching aid for those just beginning the journey along the path.